2 bedroom apartment on the 2nd floor (access by stairs). 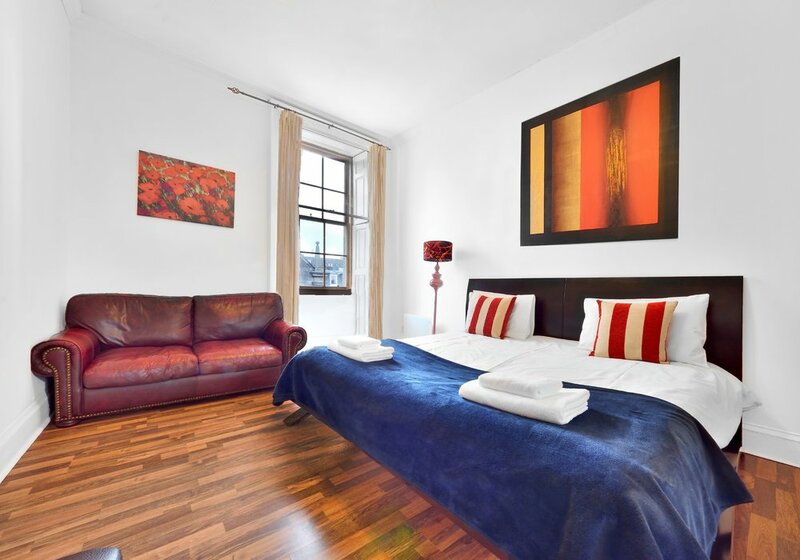 Comfortable accommodation in a historic Old Town location adjoining the Royal Mile. 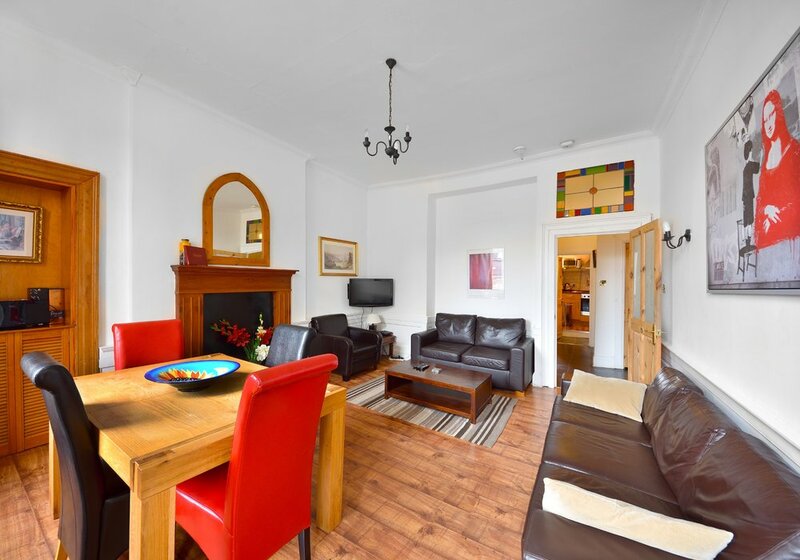 Spacious living room with sofa bed and Freeview TV, and CD player. Dining area (seats 6). Kitchen (4 hotplates, oven, coffee machine, microwave, fridge/ freezer, toaster and kettle). 1 bedroom with 1 super king-size bed. Sofa bed in living room can sleep 2 guest for £20 paid on arrival to meet and greet person. Historic listed building in Old Town in a central location. Near shops, restaurants, cafes and bars. Secure entry system. * Final balance can be taken by UK debit card, bank transfer or credit card. * Internet is offered as a courtesy of the landlord. We try to keep it available at all times, but cannot be held responsible for disruptions in service. * This is a no smoking property and not suitable for pets. Excellent location, lovely friendly welcome on arrival, clean rooms with everything you need. Would highly recommend. 6 nights over Xmas. 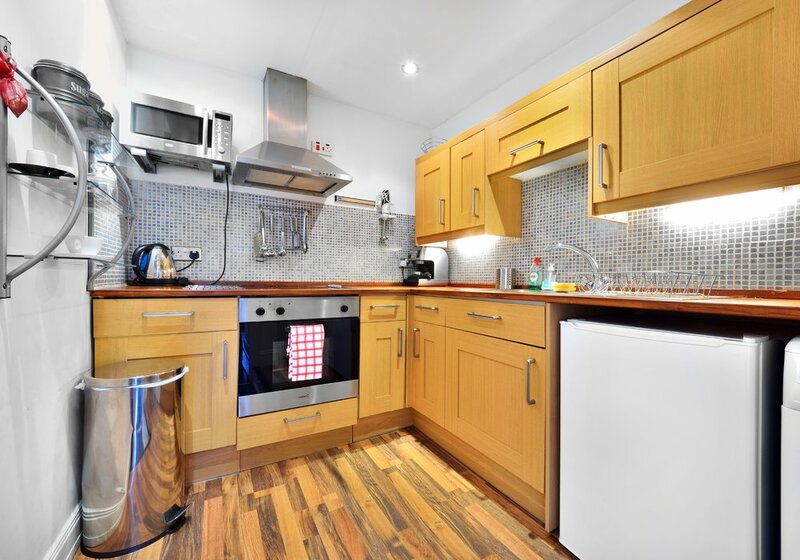 Flat was perfectly situated to enjoy Edinburgh and plenty spacious enough to have family over. Even managed a full Xmas dinner in the compact, but well equipped kitchen. Was slightly worried about the stairs as I was with 2 young kids (4&2), but it wasn't an issue at all with a little common sense. Never found it particularly noisy (it's the city centre so you will get a few drunks), but imagine that may be different during the festival. The bells of the Tron Kirk do go off every hour during the night, but I slept through this mostly and it was only mildly annoying. Overall, would definitely stay here again. 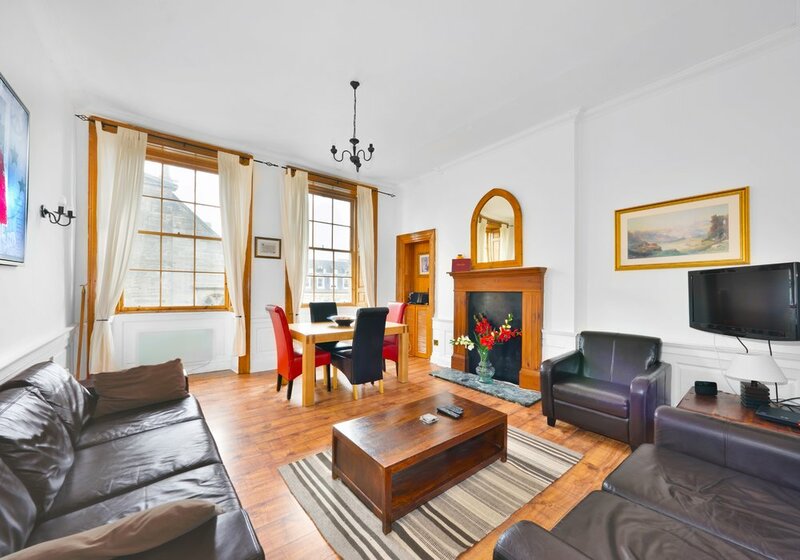 This is a roomy, well equipped flat in the very best location just steps off the Royal Mile, about 1/2 way between the Castle and the Palace! The furniture was comfortable, the wifi reliable, the kitchen well equipped. The only thing I can think that might make it a tiny bit better would be a bedside table in each room. I would definitely book again! 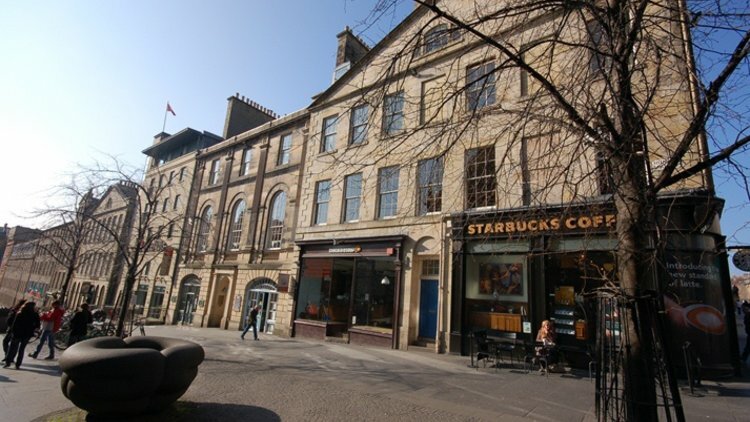 If you want to be in the centre of the Fringe, this is within walking distance of most venues and round the corner of The Royal Mile. Beautiful, stylish flat and quiet at night up 2 flights of stairs. Comfortable beds and all basic mod cons provided including Wi-Fi, and quality fittings. Would use again. 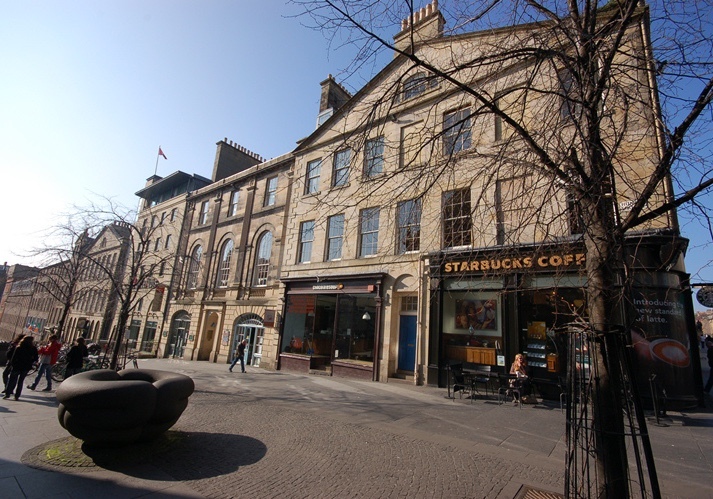 Strategically located right on the corner of Royal Mile/North Bridge, this flat is Fringe central and a short walk to all major venues which is critical for a stay in August. 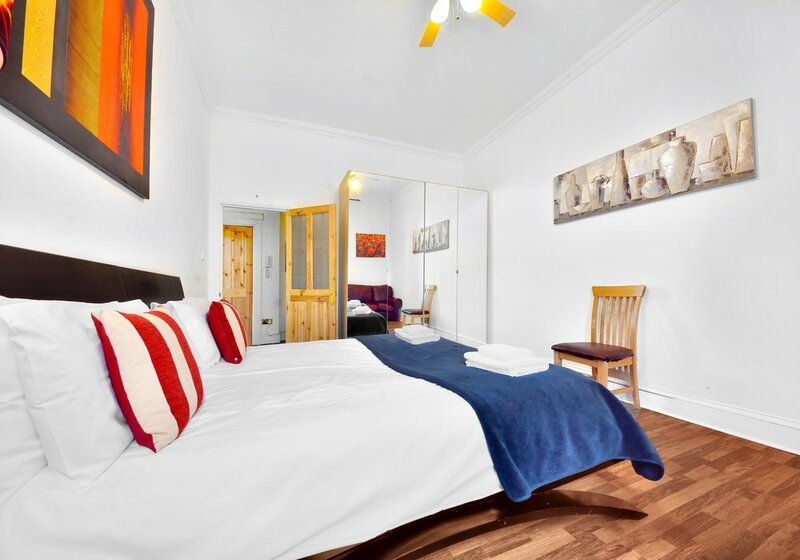 Also a short walk to all attractions and local Sainsbury's (200m). 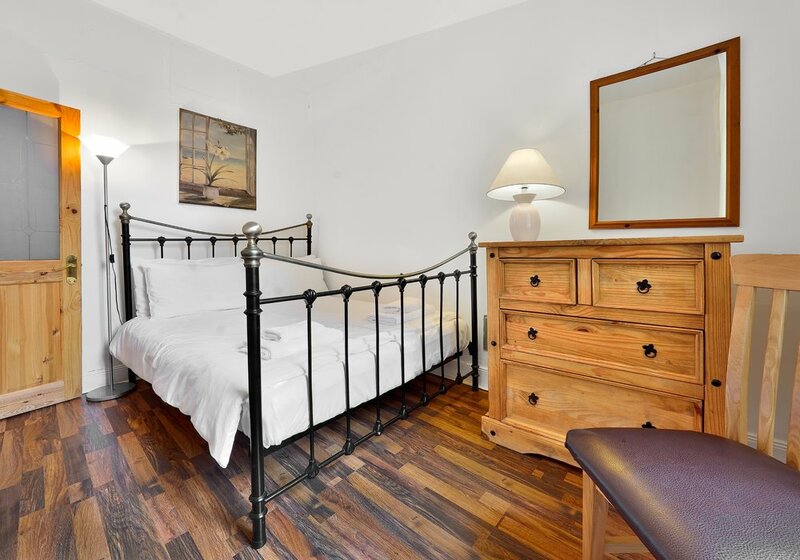 The second floor flat is clean and tidy with new electric radiators, fully equipped kitchen, good shower pressure from the electric hot water tank, there's a wireless router and the large master bedroom has a king sized bed, which is it's USP. The décor is redecoration rather than full refurbishment but actually adds to the charm with period features. There is very good natural light too. Everything works - it does what it says on the tin! 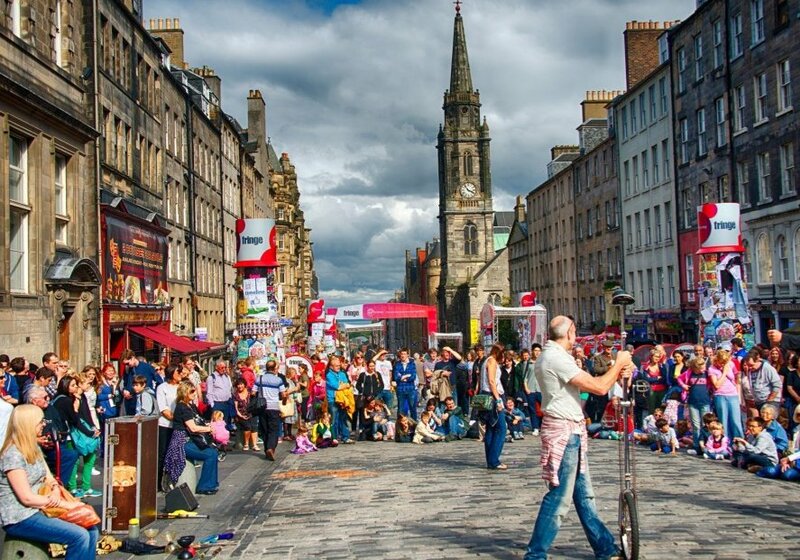 If there is any downside during Fringe time there is lots of street noise and hustle & bustle pretty much round the clock, but that can be part of the charm too. Although second floor, it's at third floor height so there are stairs to climb (with luggage). The landing shared with the next door flat smells of their cigarette smoke but the smell does not follow into this flat, which is non-smoking. The smaller bedroom is around half the size of the larger one so the flat is probably more suited to a family group or singles rather than two couples travelling together - it was perfect for our group of three. One recommendation for the owner would be to put in some bedside tables - we used our suitcases. The flat was excellent for our purposes and we would happily stay here again. Spacious, great oversized beds with superior mattresses, and overlooks the amazing social scene in the heart of Old Town. Saturday night was the most active. Right around the corner is the market (Sainsbury) to offset the Scottish avoidance of all green veggies and the U.K.'s very high eat-out prices. Scotland is totally amazing, but not the food. The flat is a sincere restoration attempt with wood floors. Fridge is small and milk curdled after two days, but serviceable. Washer only, but drying rack under the bed. Wifi worked great, a godsend since UK is still way behind in access. TV cable was slow changing channels. Walk up stairs are only just serviceable (circular staircase steps narrow on the inside like a castle step), but we made it with our luggage in a single trip. Front door at the bottom of steps: knob is loose so just push hard. No noise from neighboring flats, so only from outside (but a lot more entertaining than TV watching the human parade from window). Only a few steps from all the attractions and shopping, rail station, and day trip pickup points, so never need to take a bus or taxi anywhere -- just make sure to dress in layers with a hat and raincoat (umbrellas won't survive the constant winds!). Starbucks 2 feet away, too! Grab this place if you want to be part of the action. We stayed in this flat last year and liked it a lot. We were not disappointed this time either. It's light and a lot of space and it's located very central. It's wery well equiped, nice and clean. Unfortunately there is a very strong chemical smell in the staircase. The neighbour seems to smoke a lot and that smell was uncomfortable every time we entered our apt. Except from the smelly staircase everything was just fine! What can I say - the flat is absolutely great, couldn´t ask for anything else! Central, light and well equipped. We (2) stayed there for 5 nights and would love to stay there again. The location of the flat could not has been better - just in the center of Edinburgh, close to everything. In front the Hunter Square with lots of music and people but the windows were so well isolated - you could not hear anything from the outside noice. inside. The flat was nice with a good kitchen. We were 3 persons who lived together in the flat and we had lot of space. A good thing was the USB that helped you if you for ex wanted to load your phone . The flat was very well situated. The fittings were good and it had been well cleaned before we arrived. We found the flat clean, spacious, with above average kitchen equipment, working wi-fi. Slight signs of light wear and tear on decor were not an issue. Water pressure in the shower was excellent. The location is is ideal for festival-goers, although it can be noisy at night, which was not a problem for use but might be for some people. We would definitely like to use it again. The flat was in the very center of old Edinburgh. Very nice, very clean with all the facilities. The staff waited for us, they gave us additional sheets for the extra sofa bed. We enjoyed it really very much. 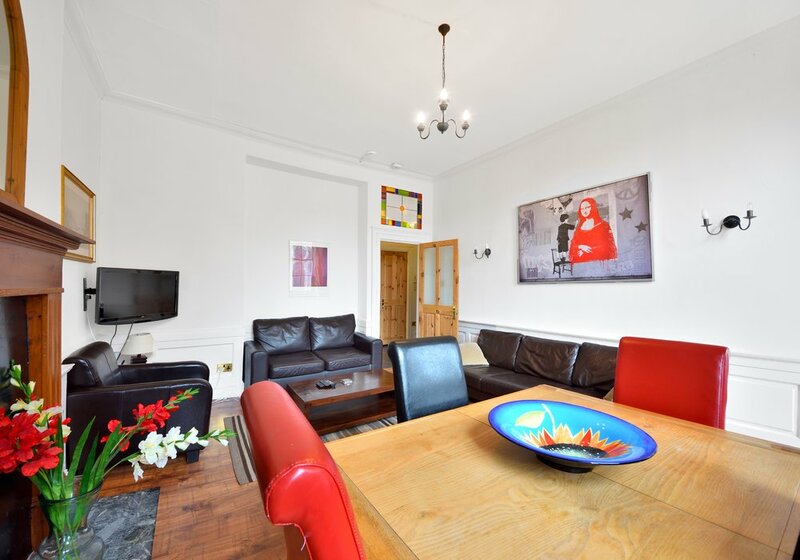 Well located flat in the middle of Old Town with plenty of character. we'll be back. the Flat was very good... It place was close to shops and other tourist attractions.. the place was also convenient and had a wonderful time living in the flat. Thank you and more power to Edinburgh-Flats. My friends at I had a lovely weekend at this flat - very centrally located on the Royal Mile and a really nice apartment overall. Check in and check out was very smooth, and Aga answered any questions that I had about the property very quickly. I definitely recommend to anyone wanting to see the sights in Edinburgh. 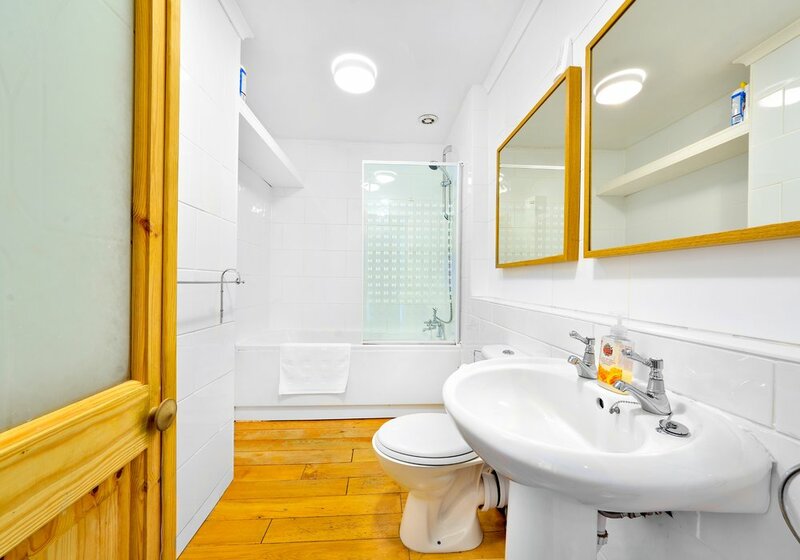 A clean, thoughtfully equipped flat perfectly located just off the Royal Mile.